An invasion of Earth by high-tech, resource-stripping aliens charting a devastating path through our Solar System places humanity on the defensive. 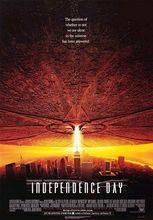 A big-budget, effects-packed spectacle that kicked off the brief revival of disaster flicks in the mid-to-late 1990s, Independence Day is the story of how an invasion of Earth by ruthless aliens charting a resource-stripping course through various objects in our Solar System forces an American-led alliance of Earth-based military powers to resist, and ultimately repel, the madness. Vivian Palermo ... Tech / Med. Asst. I love this movie. It's strangely gratifying to watch the Library Tower get disintegrated in LA. There are 2 seconds of suspense in the scene where the ship over New York City is about to give the burst of energy to the Empire State Building. The death ray just sits, while New Yorkers watch in shock and awe, then, CHYUUU, BOOOM! The ESB is gone! Then the White House gets trashed when the death ray hovers before the burst of energy destroys it once and for all. The destruction of cities is a marvel of SFX, especially that scene where a block in NYC (with a traffic light) has their building's faces obliterated by the horrific wall of fire. Great family fun! I love this movie. It's strangely gratifying to watch the Library Tower get disintegrated in LA. There are 2 seconds of suspense in the scene where the ship over New York City is about to give the burst of energy to the Empire State Building. It just sits, while New Yorkers watch in shock and awe, then, CHYUUU, BOOOM! The ESB is gone! Then the White House gets trashed when the death ray hovers before the burst of energy destroys it once and for all. The destruction of cities is a marvel of SFX, especially that scene where a block in NYC (with a traffic light) has their building's faces obliterated by the horrific wall of fire. Great family fun!